XBOX 360 compatibility coming soon. ► Please insert my name in credits if you use this pack in your patch. - Copy Chantpack V. 2 by mauri_d.cpk in download folder. - Generate with DpFileList Generator v1.6 by Baris the DpFileList.bin file and replace it in download folder. The post was edited 8 times, last by mauri_d ( Jun 26th 2016, 1:24pm ). Very good! It works, but only with Galaxy patch if you proceed in this way: rename the file, for instance "Chantpack1.cpk". Than add it to your DpFile list with help of the Galaxy switch. Than start the game. Without renaming it doesn't work. Dear Mauri_d, I hope you will do some more chants, especially for Bundesliga. Unfortunately I can't help with the chantlist. 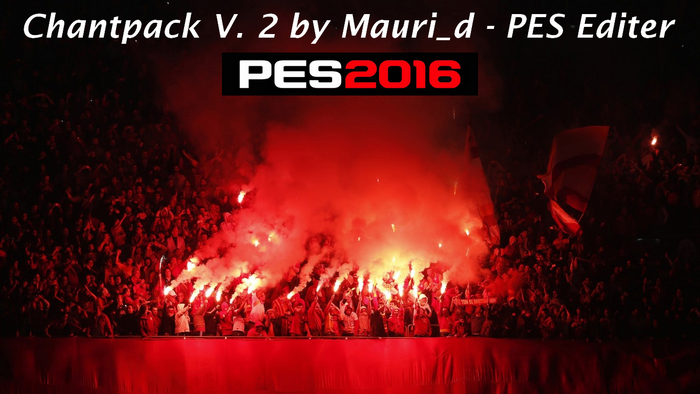 I think you know already this tutorial by Secun: pes-patch.com/forum/thread-9024.html If not, maybe it helps you. So again thanks a lot. your Chants make for me the game perfect! Yes i'll add more chants in next versions also for Bundesliga teams. I know already Secun tutorial. Because the current file name is too long. It doesnt work for some reason with such a long filename. Does it depend from Galaxy switch? With DpFileList Generator isn't necessary to rename. Yes, it's because of the PESGalaxy Patch. This looks as how this guy has a plan of the chantlist und with this software you can find somethings. Maybe this helps you? I know this video. It is a fake. 4E isn't the name of a Flamengo chant. O.k., o.k. ´, my fault. I would do everything to help you because your work is so excellent. I'm working on CHANTPACK VERSION 2. The post was edited 1 time, last by mauri_d ( Mar 31st 2016, 9:26pm ).